As Porsche prepares for the launch of its first all-electric car — the highly-anticipated Taycan — the carmaker has begun setting the stage for the vehicle’s rollout in the United States. On Monday, Porsche Cars North America, Inc. (PCNA) announced an agreement with Electrify America to provide the Taycan with three years of unlimited fast charging at public stations across the country. With this system in place, as well as Electrify America’s ongoing expansion, the Taycan would be capable of long-distance, coast-to-coast travel. In a press release about the update, Porsche noted that the charging perk would be included in the Taycan’s selling price. Under the system, Taycan buyers would receive three years of unlimited 30-minute fast charging at Electrify America locations, which is comprised of over 300 highway stations in 42 states, on top of more than 180 sites in 17 select metro areas. The established carmaker stated that each Electrify America location would have an average of five charging stalls, while some sites would have enough support for up to 10 vehicles at once. Apart from its deal with Electrify America, Porsche has also announced that its dealers would be installing their own fast-charge Turbo Charger kiosks for the company’s upcoming all-electric vehicle. Porsche would also be releasing products for home charging solutions. In a statement, Klaus Zellmer, President and CEO of PCNA, pointed out that this trifecta of charging systems — Electrify America’s infrastructure, Turbo Chargers in dealers, and home chargers — would ultimately free future Taycan owners from range anxiety. “Every Porsche is a sports car with soul, and the Taycan is soul electrified. Together, Electrify America and our Porsche dealer network will provide a national infrastructure for DC fast charging that frees future Taycan owners from range anxiety. And Porsche home charging technology will turn the customer’s garage into the equivalent of a personal gas station,” the CEO said. One thing that separates the Taycan from the conventional electric car is its capability to charge at an extremely rapid rate. Using 350 kW chargers, 800-volt technology, and the combined charging system (CCS) standard, the Taycan would be able to add more than 60 miles of range in just four minutes. That’s the fastest charging capabilities in the market today, roughly three times faster than Tesla’s expansive Supercharger Network. To take advantage of the Taycan’s ultra-fast-charging capabilities, Electrify America’s highway stations would have a minimum of two 350 kW chargers per site, with additional stalls delivering up to 150 kW. Metro stations, on the other hand, would be capable of charging at speeds of up to 150 kW as well. Electrify America is expected to have 484 locations with 2,000 charging stalls completed or under construction by July 1, ahead of the Taycan’s release in late 2019. While free 3-year unlimited access to Electrify America’s chargers would undoubtedly be a notable selling point for the Taycan, Porsche’s dealers across the country would also be offering their own charging perk. 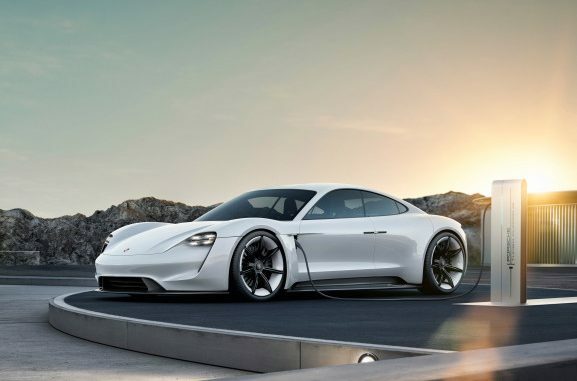 The automaker has noted that all 191 of its US dealers would be installing DC fast-charging stations for the upcoming vehicle, 120 of which would feature Porsche Turbo Charging — the company’s proprietary DC/CCS charging system that delivers up to 320 kW. Porsche dealers without Turbo Chargers would feature 50 kW fast chargers on site. The Porsche Experience Center (PEC) in Atlanta, GA already hosts the company’s first Turbo Chargers. More of Porsche’s own charging stations are expected to be installed at the PEC in Los Angeles, CA in the near future. The Porsche Taycan is the first all-electric vehicle from the automaker. In true Porsche spirit, the Taycan boasts impressive specs, from a 0-60 mph time of 3.5 seconds, a top speed of 155 mph, and a range of 310 miles per charge. The company has also noted that just like its iconic vehicles like the legendary Porsche 911, the Taycan would be at home at the racetrack being driven to its limits. As noted by a Porsche brand ambassador in an email to an auto journalist last month, the Taycan would be offered in three models — an entry-level variant, the mid-range Taycan 4S, and the range-topping Taycan Turbo, which would likely cost over $130,000 before options.